Teams submit a written proposal and (if advanced to final round) present live at a Spark Tank event. Finalists prepare a ten-minute pitch of their project idea, followed by a 5-10 minute Q&A with the judges and live audience (open to the entire Park academic community). Three winning teams each receive up to $5,000 to implement their project during the designated academic year and share the results of their project. Grant Winners share a mid-year report, complete all necessary financial documents and paperwork, and present the results of their project to the academic community. 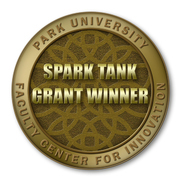 Spark Tank is an innovation grants challenge designed to create community and invigorate faculty teaching and learning at Park University. Teams of 3 (faculty or faculty/student combinations) compete in a live, show-style competition to pitch their innovative teaching and learning ideas. Three projects are funded up to $5,000 each year and this badge certifies that the recipient was one of the grant award winners.